Porcelain Veneers are thin wafers of high-quality dental porcelain that are custom-designed to change the appearance of your teeth. They can also be used to repair chipped or damaged teeth: the veneers can be fashioned to match your undamaged teeth, blending in beautifully with your natural smile. Porcelain veneers are permanently bonded to your teeth, and thus are not a treatment that is easily reversible. Your dentist will first listen to your wishes and expectations about how you would like your teeth to be altered. They will then examine your teeth carefully to determine whether porcelain veneers are able to fulfil your expectations. The appearance of some teeth cannot be satisfactorily improved using porcelain veneers, and if this is the case for you, your dentist will recommend alternative treatments. Your natural teeth undergo some light preparation: a thin layer of your tooth enamel is removed from the front of your natural teeth to allow space for the veneers. An impression of your teeth is made, and this is sent to our dental porcelain technician, who creates the porcelain veneers to the specifications that your dentist will provide. It takes up to 14 days for a set of porcelain veneers to be created. When you return to the practice for your second appointment, your dentist will bond your porcelain veneers to your natural teeth with a strong resin adhesive. You will be shown how to care for your veneers as they need to be cleaned daily. You should brush and floss your veneers, just as you would brush and floss your natural teeth. 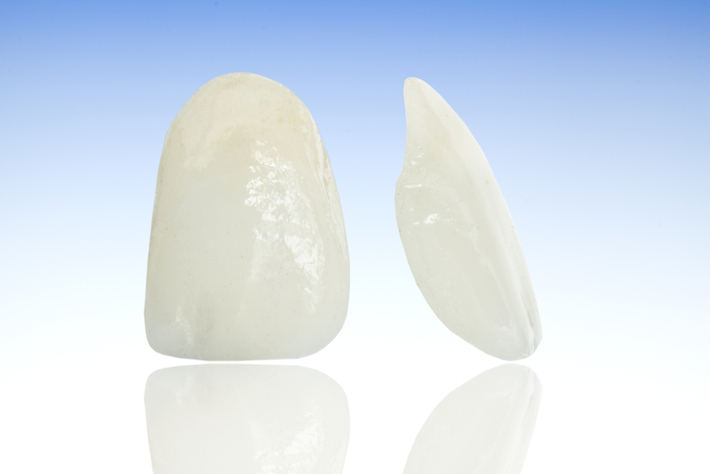 Porcelain veneers are manufactured to resist chipping, breaking or general wear and tear. However, much like your natural teeth, your veneers will likely need some maintenance during your lifetime and may even need to be replaced. Please ask your dentist if you would like to know more about porcelain veneers and whether they are a cosmetic dental treatment that would be suitable for your situation.